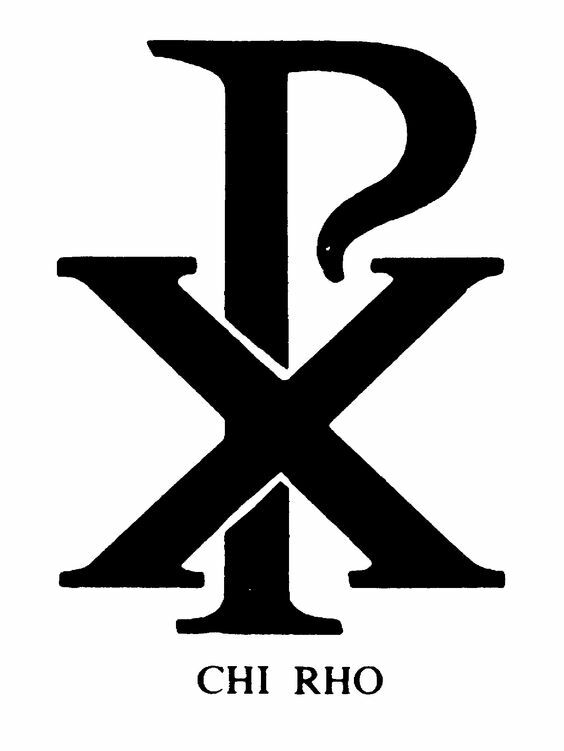 The Chi Rho (/ˈkaɪ ˈroʊ/; also known as chrismon) is one of the earliest forms of christogram, formed by superimposing the first two (capital) letters—chi and rho (ΧΡ)—of the Greek word ΧΡΙΣΤΟΣ “Christ” in such a way that the vertical stroke of the rho intersects the center of the chi. The Chi-Rho symbol was used by the Roman emperor Constantine I (r. 306–337) as part of a military standard (vexillum). Constantine’s standard was known as the Labarum. Early symbols similar to the Chi Rho were the Staurogram (Christliche Symbolik (Menzel) I 193 2.jpg) and the IX monogram (Christliche Symbolik (Menzel) I 193 4.jpg). In pre-Christian times, the Chi-Rho symbol was also to mark a particularly valuable or relevant passage in the margin of a page, abbreviating chrēston “good.” Some coins of Ptolemy III Euergetes (r. 246–222 BC) were marked with a Chi-Rho. Although formed of Greek characters, the device (or its separate parts) are frequently found serving as an abbreviation in Latin text, with endings added appropriate to a Latin noun, thus XPo, signifying Christo, “to Christ”, the dative form of Christus. The Chi Rho symbol has two Unicode codepoints: U+2627 ☧ Chi Rho in the Miscellaneous symbols block and U+2CE9 ⳩ Coptic symbol Khi Ro in the Coptic block. Even Online It Ain’t Easy. All that is was created, and Pope Francis as the head of a global religion with the most members on the planet has now taken to Ted Talks to get his message across, but as the symbolism above demonstrates, we are still comitted to the mission of Keeping It “P” regardless.